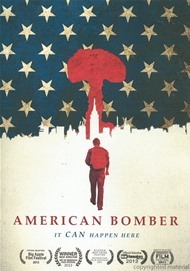 American Bomber, writer/director Eric Trenkamp’s feature debut, is very much a work of amateur cinema. It tells the unconventional story of John Hidell (Michael C. Freeland,) a dishonorably discharged soldier who makes his way to New York City for a suicide bombing mission. You’re never really sure why he wants to do this—the first part of the film is a confusing mixture of present­-day narrative fiction (John’s story about getting discharged) with pseudo­documentary interviews of people from John’s life that presumably paint a portrait of his psychologically unstable past. Which sounds like an interesting mystery, except that the acting, dialogue, and camerawork are completely amateurish, a forgivable trait if this were, say, your pal’s senior college project. As an official commercial release, however, the mystery here lies in figuring out why IndiePix chose this, out of hundreds of indie movies, to distribute. Michael C. Freeland and Rebekah Nelson in American Bomber. Presumably, it’s the controversial topic. It’s unfortunate, but the film never provides the slightest insight into suicide bombers. John Hidell seems more like an offbeat hipster who takes a bus trip into the city, where he meets Amy (Rebekah Nelson) a Brooklyn bartender who’s charmed enough by this oddball character to let him into her bed, taking the film on a weird detour, as both Hidell and the film forget the suicide mission for some fun NYC romance. Surprisingly, Freeland and Nelson (by far the best actor in the film) actually have some decent on­screen chemistry, and their scenes together feel like another movie entirely, one that’s 180° from the rest of the film. It doesn’t help that director Trenkamp drops the documentary shtick halfway through, except for some occasional rants by a creepy inmate named Speiler (Kenny Wade Marshall), whom Hidel met while in prison and who is presumably the mastermind behind this terrorist mission. You can learn a lot from the flaws found in amateur films, and they always carry a certain charm missing from professional works—two reasons why you might want to check this out. But if you’re looking for insights into the mind of a suicide bomber done in an artful way, you might be better off renting Paradise Now.